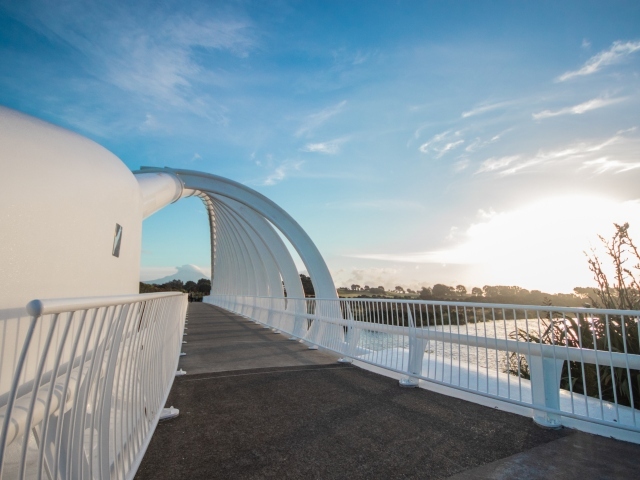 The award winning New Plymouth Coastal Walkway spans 12.7km along the New Plymouth coast line. Crashing waves, and crystal ocean as far as your eye can see, are enough of an attraction themselves to stop you in your tracks and capture your attention. The piers along the coastline are designed for just that, to stop, take in the fresh sea air, and leave you with no option but to be present in the peaceful setting. 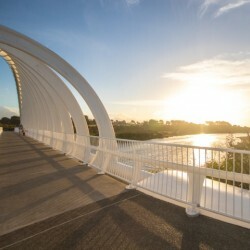 The walkway is bike, pram, scooter, mobility scooter, and wheelchair friendly, so this is an adventure that can be enjoyed by absolutely everybody. With three swimming beaches, four playgrounds, a golf club, farmlands, rivers, and access ways to shopping areas along the way, it is a collection of fun filled experiences. 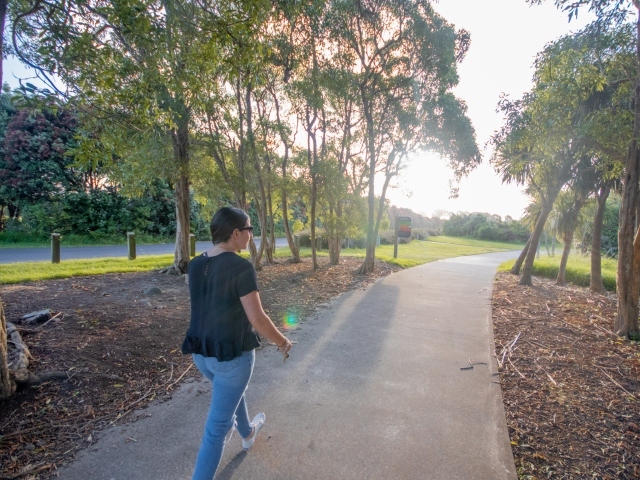 Many access points with parking along the Coastal Walkway allow for short walks or enjoying one activity at a time. Begin your adventure at Ngamotu Beach, near the port of Taranaki. This is a safe, family friendly swimming beach, where children can play in the small breaks of the water. If you are venturing with children, they are sure to notice the playground, one of many along the Coastal Walkway . There are a number of cafes and restaurants in this area to enjoy a meal or drink at before you set off. Park under a tree in the shade, there’s plenty of parking to choose from. Not long after starting your journey, you’ll come to Kawaroa Park. If you were planning to stop at just one playground on the Coastal Walkway , this would be it, a favourite for children. Next door, Todd Energy Aquatic Centre has an indoor heated wave pool, children’s pools and hydroslides. The outdoor 50m lane pool, diving pool and children’s pools are open in summer months. 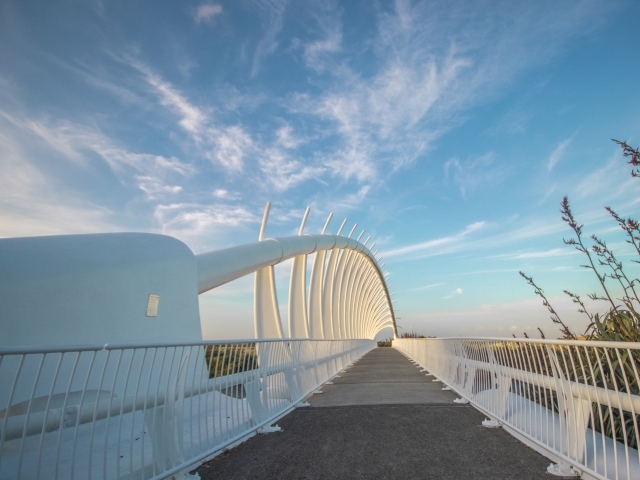 Carry on to New Plymouth’s iconic 45 meter tall Wind Wand. Designed by internationally renowned New Zealand artist Len Lye, the Wind Wand is constructed of a fiberglass tube with a sphere at its top, which can bend up to 20 meters in any direction. In this area you will also spot artistic stone carvings and pieces of art. Right in the CBD, here’s your chance to take a detour and enjoy the shopping New Plymouth has to offer. Further along the Coastal Walkway you’ll find East End beach, another great spot for swimming. If you’ve packed sandwiches to share, stop and feed the friendly ducks at the river mouth. In summer, Paris Plague Cafe with outdoor seating, will let you enjoy a coffee or ice cream in the sunshine. And yes, another playground stop. Continue on to Fitzroy beach. As well as a fantastic swimming beach, it’s a popular spot for national and international surfing competitions. A recommended beach to spend the day at. 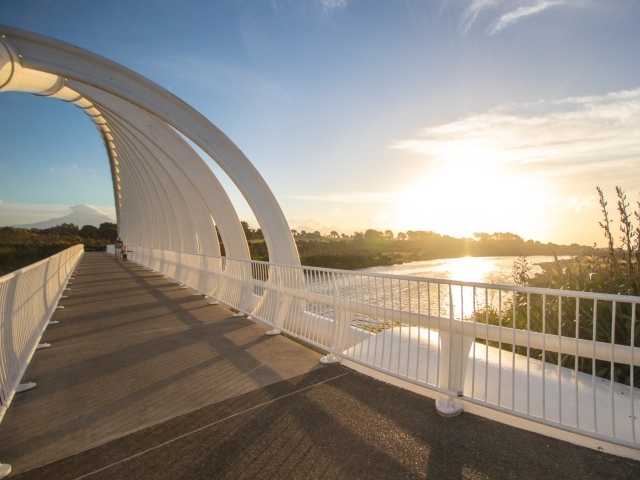 Next up on the journey is the Te Rewa Rewa bridge. 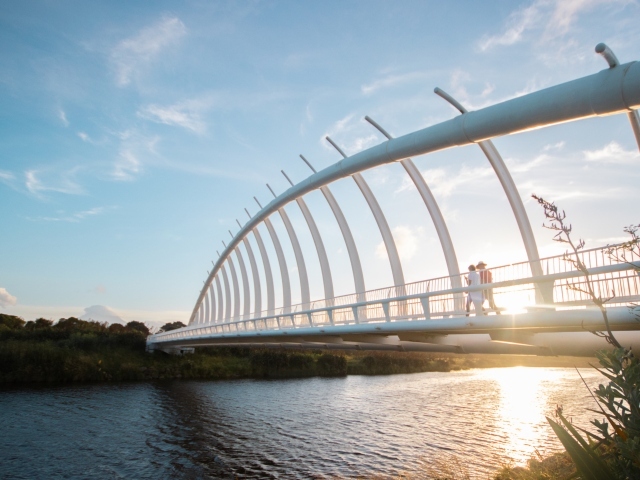 This is an Iconic 83 metre long bridge, reminiscent of a breaking wave or a whale skeleton. 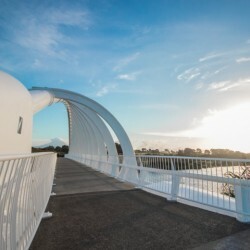 The arches of the bridge frame Mt Taranaki spectacularly in the distance, make sure you have a camera. Beautiful green farmland will be your view for the last part of your adventure, and you’ll see a series of small coastal lagoons before you finish off at Hickford Park. 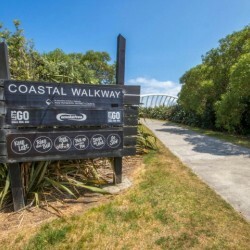 If you have biked the coastal walkway, or you are starting the adventure from this end, the cycle park is a must. It includes a 1.75km closed circuit and a 333 metre banked velodrome. Children will love biking along the junior mini road circuit, complete with traffic lights and roundabouts. 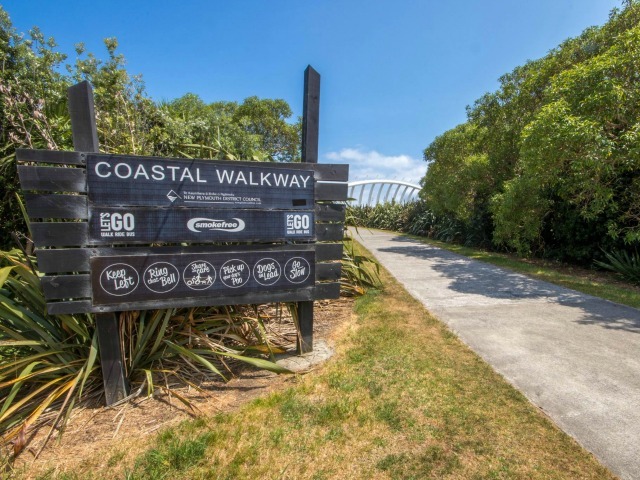 The Coastal Walkway comes highly recommended by visitors to Taranaki. On a beautiful day it’s breathtaking. A peaceful stroll or a day of adventures, this attraction has it all. Do dogs need to be on leads? Yes, dogs are allowed on the walkway but must be on a lead. 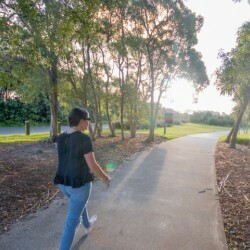 Can you hire mobility scooters to use on the walkway? Yes, mobility scooters are available from the Todd Energy Aquatic Centre for use on the Coastal Walkway. The scooters are free to use between 8am and midday and from 1pm to 5pm, and are available every day except Christmas Day. Do you need to wear helmets if biking on the walkway? Yes, normal road rules apply. Stick to the left and wear your helmet.